MAPFRE Economic Research is launching a digital review, to be published every six months, which contains information of interest to readers on relevant economic and financial topics linked to the workings of the insurance industry. The review also provides MAPFRE Economic Research forecasts on the main macroeconomic aggregates such as GDP, inflation, exchange rates and interest rates. The review will also feature special collaborations on insurance-related issues, analyzed from a global perspective by a network of well-known guest contributors. The summary of the first issue includes articles on pensions systems, insurance penetration drivers in Latin America and insurance sector investment allocation. Also included is an analysis of economic and financial perspectives for 2018 and their impact on insurance activity, and a discussion of the usefulness of copula statistical methods in risk measurement. 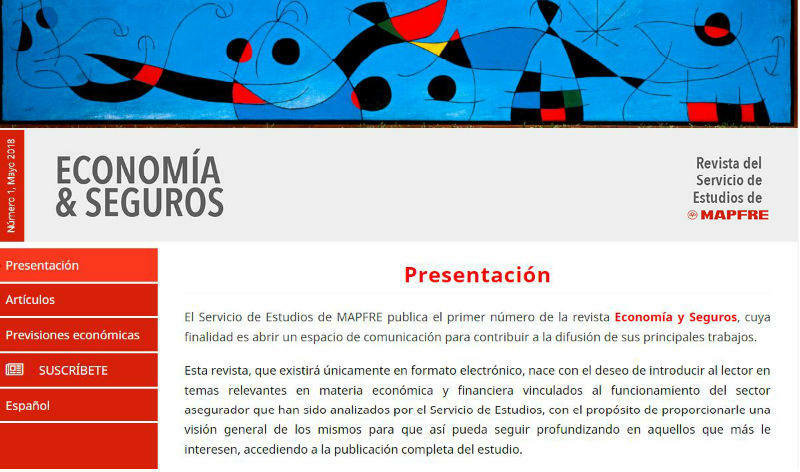 MAPFRE Economic Research aims to promote, contribute to and influence both general economic debate and discussions related to the financial system, the insurance industry and the prudential regulatory framework. Click here to access the new review. We hope you enjoy it.